Sedum morganianum aka Burro's Tail or Donkey Tail Plant is very easy to care for & propagate. I grow mine in the garden but it makes a great houseplant. Get care & growing tips here. This sedum is a most handsome succulent. Mine happily resides in a large square terra cotta pot with my now 5-year-old Coleus “Dipped In Wine” (yes, they’re technically perennials) and a Golden Weeping Variegated Boxwood which I brought home from Kew Gardens as a wee cutting. One would not think to use these 3 plants in a container together but it works for me and that’s another story. 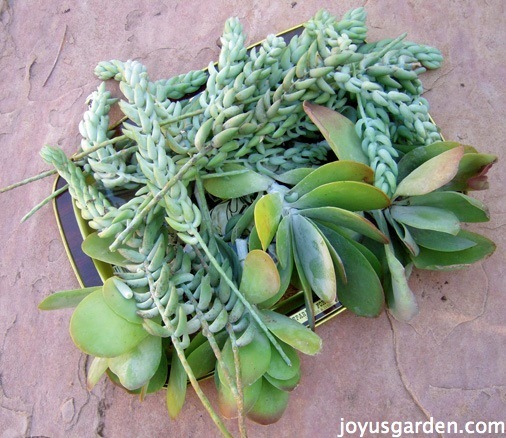 In this post, I’m going to tell you how I care for and propagate my Sedum morganianum or Burro’s Tail, Donkey’s Tail or Horse’s Tail. 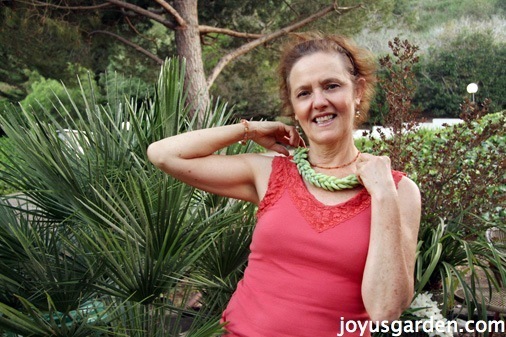 If you want a real icebreaker at parties, then wear your Burro’s Tail as a necklace! This plant eventually grows to 4′ long which will take around 6 years or so. As it grows it gets very thick with those trailing stems heavily laden with overlapping plump, juicy leaves which form a groovy braided pattern. As you can imagine, a mature plant gets very heavy. This plant is not for a flimsy pot with a flimsy hanger. It’s best grown in a hanging basket, in a large pot like mine, in a pot that hangs against a wall or trailing out of a rock garden. In terms of care, a Burro’s Tail couldn’t be easier. I’m going to cover that below along with propagation which is something you’ll want to know how to do because all your friends will want a cutting or two. Mine grows outdoors but I’ll also tell you what it needs if you want to grow it in your house at the end of this list. Sedum morganianum likes bright shade or partial sun. It will burn in strong, hot sun. Mine gets morning sun which it prefers. And now, because my neighbor cut down two of his pine trees last year, it gets some afternoon sun too. If you watch the video at the end you’ll see the stems that are getting too much sun are a pale green. This plant should ideally be a lovely blue-green. I may have to move it to a less sunny spot – I’ll watch it and see. All those leaves store water so be sure not to overwater it. It will rot out if you do. My Burro’s Tail is well established (around 5 years old) so I water it every 10-14 days but give it a thorough drink. Watering this way also helps some of the salts (from the water and fertilizers) to flush out of the pot. The rainwater mine gets in the winter helps with that. In other words, don’t splash and go every other day. In the growing season, when the days are warmer and longer, I water it more often every 9-11 days. As a rule, plants in clay pots will dry out faster as will larger plants in smaller pots. Adjust accordingly as well as to the weather conditions. Like any other succulent, this one needs good drainage. The water needs to drain out of it fast so it’s best to use a mix specially formulated for cactus and succulents. I buy mine at California Cactus Center near Pasadena in case you live in that area. Or, you can add horticultural grade sand and perlite (or fine lava rock, gravel or pumice) to lighten up whatever potting soil you have. My secret planting weapon is worm castings. Your Burro’s Tail would love a bit of that too. By the way, I top dress all the containers in my garden with compost and worm castings every Spring. To have your Burro’s Tail flower is rare. Mine bloomed for the first time ever this year although there were only 3 clusters on that big ole plant. Temperature: Here in Santa Barbara the average low temperature for the winter months hovers around the low 40’s. We occasionally dip into the thirties but not for more than a couple of days. Mine is up against the house and shows no signs of stress during those brief chilly spells. Our average summer temps are in the mid to high 70’s which is ideal for the Burro’s Tail. The only pests that mine ever gets are aphids so I just hose them off every month. Burro’s Tail really isn’t susceptible to a wide range of insects. You can spray it with a mixture of 1/5 rubbing alcohol to 4/5 water if hosing off isn’t doing the trick. Neem Oil, which works on a wide range of insects, is an organic method of control that is simple and very effective. Like most succulents, Sedum morganianum is a snap to propagate. Simply cut the stems to the length you want, peel the bottom 1/3 of the leaves off and then let those stems heal off (this is where the cut end of the stem callus over) for 2 weeks to 3 months before planting. When you plant your cuttings, you might need to pin them down in the pot because the weight of the stems will pull them out. You can also propagate it by individual leaf cuttings which you’ll see in the picture below. Just a head’s up because the leaves break and fall off this plant very easily. If you want to know more on this subject, I’ve done an entire blog post about propagating sedums . My Burro’s Tail cuttings are healing off. You can also propagate it with the individual leaves. Baby plants are emerging where the leaf meets the stem. Simply lay the leaves on top of your cactus & succulent mix & they’ll root in. Keep it on the dry side. Burro’s Tail makes a fine houseplant. It is commonly sold as an indoor hanging plant.You can get your own burros tail here. Put it in a spot with nice, bright light but out of any windows with strong, hot sun. You might have to move it in the winter time as the sun shifts to a place where the light is brighter. It’s very important to not overwater this plant. Those leaves store a lot of water so don’t do it every week. Depending on the temperature and light in your home, a thorough watering once a month will probably be enough. First off. I’m terribly jealous of your succulents! I bought my burro tail approx. 3 weeks ago. The longest braid is maybe 6-7 in. W/ 5 more surrounding itself all about 4 in. My issue is I tried saving it from the store since its stretched itself. I’m gathering from not enough sunlight?? The braids are NOT compact like your little beauties. In fact, I considered it being a different plant. I now am sure it’s the same. Should I do anything special so it fixes itself? Add sunlight was the first thing I did. New growth is appearing!! Sorry for the novel, but I’m desperate for this to grow properly!! Thanks again! Hi Tara – I love my succulents & they do so well because I live in a climate where they grow outdoors in the conditions they love. I promise not to gloat! 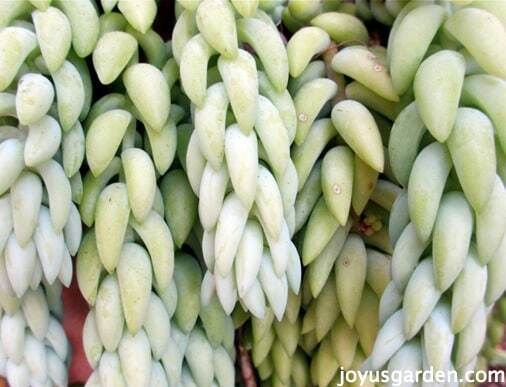 Burro’s Tails need a lot of light but no direct, hot sun for prolonged periods of time. All those little leaves store water so go easy with the water, maybe every 2-3 weeks depending on the conditions it’s in. It’s grows slowly at 1st, but then picks up the growth rate over time. I take cuttings of mine 3-4 times a year because it grows so thickly. Give it lots of bright light, fertilize it only once a year & keep it on the dry side – your Burro’s Tail should do just fine! I’m interested in knowing how you would transport a Burro’s Tail on a 2-3 day trip (via car) from California to Colorado. The plant is currently doing fairly well outside in a bench-shaped, hanging planter that has the soil/moss mix covered with chicken wire. I plan on changing to a more conventional hanging pot that will look more attractive inside once we get to our new home. I’ve thought of placing it in a loosely gathered plastic trash bag to catch all the little leaves I’m going to lose. As the braids are not very long (most are missing a couple inches of leaves at the base, although some are very tight and in great shape — even flowering! ), I plan on cutting the branches off and transplanting as you suggested. I intend to transplant them as you’ve shown in your “healing off” picture when we reach our destination. My biggest concern is GETTING it there! Do you have any suggestions? We will be leaving in about two weeks and I watered it 2 days ago. Thank you for whatever help you can give me! I do hope this is where I sign up for your newsletter/blog/or whatever you call it. Am I correct in thinking that you can put the stems directly into soil to propagate and don’t need to root in water first? Hi! I was given a few tails off a Burro’s tail. They were given to me in a plastic cup with a little water in it. Should they be left in the water to root? If not, should I just let them sit out on a counter to “air dry” for a week or two before potting? Thanking you in advance for you advice/assistance. Have a great day! Hi Nell, Thank you SO much for sharing your wisdom and pic’s of your succulents! I have just recently purchased a burro’s tail in a 4″ nursery pot. I am wanting to transplant it into a heavier hanging pot, but as you mentioned earlier….just touching the tails the leaves fall off. I thought I might try wrapping it loosely in t-shirt fabric and then gently removing it from the container. If you have a better suggestion, I would love to hear it. I live in Oregon so growing succulents outdoors, other than hens and chicks as far as I’ve found the plants don’t do well. We just get too much rain here. So anyway, because I just love them…I’m not letting that keep me from growing them in containers! Okay, so I’m rambling!! Happy gardening!! My Mom gave me a burros tail 43 years ago. Mom just passed away a month ago and this plant is now flowering for the very first time! My burro tail leaves are shribbling!!! What am I doing wrong? were doing well. But all of a sudden they’re shribbling up! Am I over watering? I live in Hawaii. Summer right now is hot/humid. I water every 3 days. Am I not watering it enough? This site was interesting and very helpful.My dad gave me a donkey tail plant in a pot in 1966 and I still have it today. It has been through every challenge imaginable and still survives despite my lack of knowledge and care. Thanks to stumbling onto your site I now have the knowledge I need to make this plant explode. Thank you, Richard. Enjoyed the post, the pictures are something for me to dream about. I was wondering about burro’s tail blooming. It seems to be a rare thing as far as what I have read. I live in Montana and have had burro’s tail for years and it thrives as far as growth but never blooms. It is of course an indoor plant here but gets long hours of sun in the summer but limited hours of sun in the winter. I was currious if this may be why mine never has bloomed. If there are special conditions to help it bloom, your advice would be greatly appreciated. Hi. someone gave me a piece of a burrow’s tail a couple of years ago, said it would take root and propogate like mad, but it has done nothing! It’s not dying..it looks healthy enough…it’s in a south facing window (maybe should move to east?) and I water it occasionally. What am I missing? Hi Nell,, I just found your site. It’s very informative,, I really like that I can ask a question concerning my donkey tail. I started from several cuttings, I have 5 ,all growing well. They are all upright 7-12 inches long with leaves upto 2 inches long. Will the stems and leaves turn downward at some point?? Thanks for sharing your knowledge and experience of gardening. Thank you for all the valuable advice you give about properly caring for succulents. I bought a Burro’s Tail about a month ago and I’ve noticed that all its leaves are drying out. I had it outside in a very shaded area, but moved it to a more sunny area after noticing that it is not doing well. It hasn’t improved. I live in Florida, so I think the temperature is not a problem. If you can help me with any comment or advice, I would greatly appreciate it. Thanks again. Be well. Happy succulent-ing!!! Hi, Guys . . Terrific info here & in videos, Nell!!! Thx much! Bought 6″ plastic hanging pot of burro about 10 days ago &, of course, now obsessed . . It’s growing & was looking good, but noticed a few little spots today on some leaves, panicked, & watered. Think now might be sunburn as see the same on one of your plants. Live in New Orleans northshore area & have at edge of covered porch in morning & noon sun. Still 80s- low 90s. Appreciate the specifics, Nel ! . . I’ll try to watch the sun move through locations for a better spot. Backyard would be great for bright shade but no protection from rain. Today, pulled up & transplanted 2 stems with roots so now have room to check dampness to mid-depth of pot. Surprised still VERY wet from water 2 days ago. Pressed a tightly rolled paper towel down the side & soaked up excess. Think soil needs less often & less amount. Wow…have I ever been mistreating my Burro! Actually it’s not mine and that is why I am losing sleep over caring for it. I’m babysitting it for my son in law who was given it by his deceased grandmother. Having read your blog I see where I may have been going wrong but would still like some advise about transplanting. How big a pot should it be in? It is currently in a six inch clay pot and the spindly trails are about six inches long and have not grown in the year that I have had it. What mix should I use and should I fill the new pot half way and try to extracate the burro with as much of the existing soil as possible or shake it off? Will there be roots that I should be careful with? If you think I’m nervous about this, you’d be right. Thanks for your help. I am from Singapore & I find it extremely difficult to grow this Burros tail succulent. 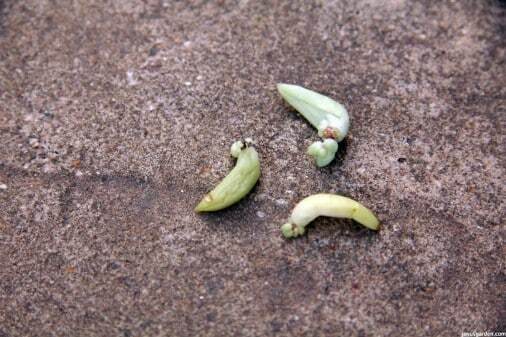 I watered my Burros tail about 14days but the leaves continue to shrivel like dried raisins and eventually die. Bought another pot but it lasted only a couple of months!!! Can advise me where did I go wrong? Hello, I just bought a burro’s tail plant and the guy at the store said I should not repot, but instead bury the existing plastic pot in the new pot and cover with soil. The current pot is tiny but works for now, but I’d like to re-pot before it gets too big. Do you agree one should not re-pot a burro’s tail? Thanks for all the great tips! I have been growing Burro’s Tails for years with some success, and some failures! The current pots are in a Florida pool porch, out of the sunlight, but near enough. The current tails are about 3′ long. I bought another potted pot and put on another porch, out of sunshine, but near the screened window. I water all of them no more than every three weeks. But the new one, suddently lost many of the leaves. I think the wind got too much for it while I was not at home. Question: Why does it loose leaves without reason? Why does a healthy, not over watered, version begin to fall apart? Thanks for your blog… looking forward to reading more! Hello! I bought my burros tail on a website about 2 months ago and it arrived all healthy and well, it was so beautiful. Since then the leaves started falling out and it’s drying up by the bottom of the stems, it’s not the same plant I bought it got a few tails left. I made sure not to give it a lot of water and it gets enough sunshine. What could I be doing wrong? Your video was amazing. If I tried to pick up one of those “tails” on my Donkey’s (Burro in Spanish) Tail that I’ve had for 10+ years I am afraid more than half of the “leaves” would fall off. I’ve grown mine indoors (live in a cold climate) and some of the tails are (were) 5 feet long until my husband accidentally knocked it over. I need to transplant what is left of the plant but I’m afraid when I do, that all the leaves will fall off. Do donkey tail produce pups? Or do the leaves fall off and produce new plants in the planter? How do you get multiple strings out of a planter naturally without growing new cuttings? Hi Nell , I am wanting to plant Burro’s tail in a collar container in a large pot which has a tall silk tree. The goal is for the Burro,s tail to drape over the container, hoping this will give the silk a more natural and soft look. It will get plenty of light. Is this possible, or am I wasting my time. Darlene from Sacramento Ca. I found your wonderful site today while searching for info on propagating my string of pearls. I have donkey tails as well and sure enough you had easy answers for both. I wish I had known it was this easy all along! I would have started sooner! Now that I have your direction, I’m not so afraid to snip my plants. On a side note – please tell me what the gorgeous green succulent is that is creeping around the rock in your first photo. I am about to re-landscape a small courtyard off the entry of our home and would love to fill in some areas like this. Thanks so much for your advice and for sharing your love of plants. Hi Nell, I have a sad (acquired one without knowing what it was called or how to care for it) Burros tail. I will now look after it properly. Thank you. Silly question. When propagating, after cutting the stems to the required length and peeling the bottom 1/3 of the leaves off where do you leave the stems to heal before planting and how do you care for them in this state. Sorry if this sounds daft but I’m a real newby at this. Many thanks in advance. So appreciate your enthusiasm. Hi Nell, I recently purchased a sedum morganianum on-line and it arrived very healthy and in a 6″ pot. Since I have never owned a donkey tail before, can you tell me if I should repot this plant into a larger pot before or starts to trail? If yes, what type of soil should I use? Thanks in advance for your information. I live 70 miles north of Santa Barbara and have had both of my donkey tails for 31 years. They are pretty massive and I keep it trimmed by giving cuttings (or making new pots of donkey tail plants) to give away (it hangs about 4-5 feet long in a protected area under a east-facing eave. My question: It has started developing black mold (sooty mold maybe from what I read). First time I’ve ever had any problems associated with it (and it flowers all the time!) how do I get rid of the mold? Wondering if my plant, I will call pork n’bean will survive over our winter here in Olympia, Wa. We get a lot of rain and will get some snow but it looks so good now I hate to disturb it. Don’t know the proper name but it has little tube like leaves that turn red on the tips in the summer sun. I just bought a Burro’s Tail plant today and made my own hanging planter!! I am very excited about my new plant addition to my home! I was wondering how you prefer to water yours? I was told when I bought it to never water them from above. I was told to set the pot in a pan of water and let the plant soak up water from the bottom. I was wondering if this is what you do as well. 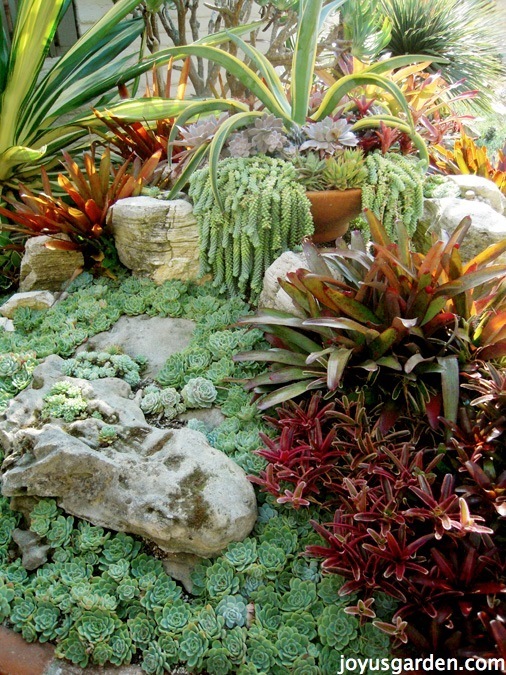 Ive also heard of just misting succulents to avoid over watering. What is your opinion? Hello thank you for the advice you’ve provided! I was wondering if you could help me with my Burro’s tail that I just bought. It had a lot of white spots that were spreading, some of them were bumpy. I thought they may be a fungus or from bugs and online it said to wipe it off with alcohol. Most came off that way, but I worry that that is too strong, and the white spots are still spreading. I was hoping to propagate it but I don’t know if it’s okay to do with those spots. When I was doing this, one of the leaves was red inside. Do you know if that from the fungus or bugs? Or is it normal? There was only one that way from the many I broke off. Thank you for your help again! Hi Nell! I got my Burro’s Tail about a month ago, and I’ve only watered it once and have kept it in indirect sunlight but the part of the stem once it comes out of the dirt is drying up, yet the rest of the plant looks completely fine and healthy. Is this normal once it starts to hang off? Love this plant just wondering if it is safe for babies, in case they get hold of it and eat it? I know string of pearls are and have removed them for safety reasons although I love the plant, so need a replacement. Hi! Ive had one of these for about two years. I neglected it for a bit but really started taking care of it back in April. The lady that sold it to me said to give it a small amount of water every 4 days so thats what I did, and it started growing nice and plump again. But I left it with my mom for about a month and gave her the same directions. when I got it back, one of the stems had some yellow leaves which I assumed it was overwatered. So I decided to start giving it water only once a week. I started putting it by a skylight window where it gets lots of sun all day. But now the leaves are all starting to shrivel. They are still green but are starting to look like raisins. I’m not sure if this means its underwatered, overwatered, or getting too hot of sun. I don’t want it to die because its like my pet now lol do you have any advice? I’m having an issue with my burro’s tail and im not quite sure whats going on. At first I thought it was underwatering, but the issue persisted, then I thought it might be overwatering, and the issue STILL persisted. The leaves aren’t falling off or yellowing or anything, they’re fine in colour, but they’re soft and wrinkled. There’s a bunch of healthy looking new growth starting all over the pot, but the established plant isn’t doing well at all! For a little while some of them had white spots on the leaves, but I cut off all stems that seemed affected and there are none left. Any idea what this is or how to fix it? I really enjoy reading your blog! I brought back some cuttings of burro’s Tail from West Bengal, India last April. They’re also indegenous to that region. They reach 4-6 feet long there and are so beautiful! Anyway…i followed your instructions for propagating, they did well, but as soon as I’ve planted them, nothings happened and it looks as if they’re dying. I’ve followed your instruction on water, sunlight…etc… i live in central Germany and it is rainy and humid. I keep it indoors. Is there any way I can send you a photo so you can see them and maybe give me a rough diagnosis? Thanks do much!!! Hey Nell!! I am desperate to rescue our beloved burro’s tail plant. We have about ten very long strands coming out of a hanging basket indoors but my stems look nothing like yours. They are brown and dry I am afraid we gave it too much sun this summer when we took it outside. Some of the leaves are plump and healthy looking but others are dried and shriveled to microscopic size. I bought a new hanging basket with succulent soil mix and I’m trying to figure out the best way to bring this lovely plant back to life. Can the stems be restored or would I be best off taking some of the leaves and putting them into my new pot and starting over. I would also like to save the original plant if possible because it belonged to my late sister in law. Any advice you can give would be much appreciated. Great info! I just purchased a small burros tail plant and I have a history of under watering and over watering my succulents. I live in Canada so it will be a houseplant, do you think it would be ok in a west facing window or is that too much direct light? This plant burns in direct sun. If it’s 5-10′ away from the west window it would be fine. In the winter when you have less sun up north, it would be fine. Just don’t let it touch hot or cold glass. Loved this article. I received two clippings from a friend that have rooted and grown really well, but it is only two tails. To get more Tales growing do I have to propagate more, or will more tails start to grow? The ones I have now are about 4 inches long, so how long would I wait to take a clipping? A year ago i bought one it had just 2 little tails, it hasn’t grown at all, Is it an slow growing plant? I put it inside under a dome where’s good light all day, but the leaves started to dry out. I moved it now to the garden but now I’m afraid it will get to much sun hahaha. How can I help it grow? I really look forward to get it like yours they are beautiful!